- maybe a separate autoplace for every display ? I have attached a first quick and dirty screenshot. > > always been visible. > > code base when you're finished. > > > feedback in the canvas.... ;) The rectangle is not redrawn. > > >>of it way back when). > > >>button that saves the current autoplace settings as the default. > > >>>I think that the policy autoplace uses is not that, what I want. 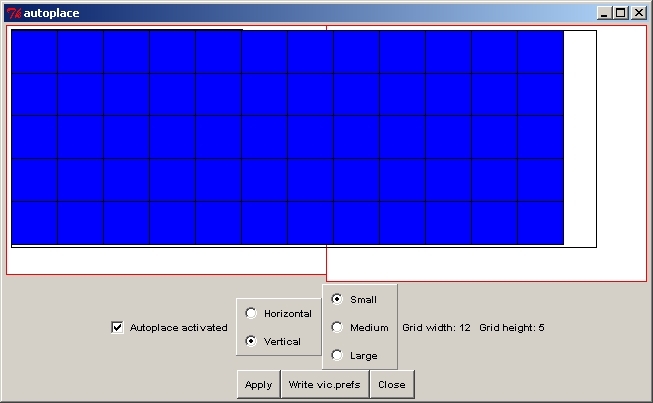 > > >>>an other window size the grid is not computed again. > > >>>frames such as rear projections or SMARTboards. > > >>>will so this. Or are there any restrictions in changing the code? > > >>>there already any attempts for those changes? > > >>>>devenv vic\vic.sln /build "DDraw Release"
> > >>>>Can you say more about the changes you plan for autoplace? > > >>>>>discovered yet, with this info I need.